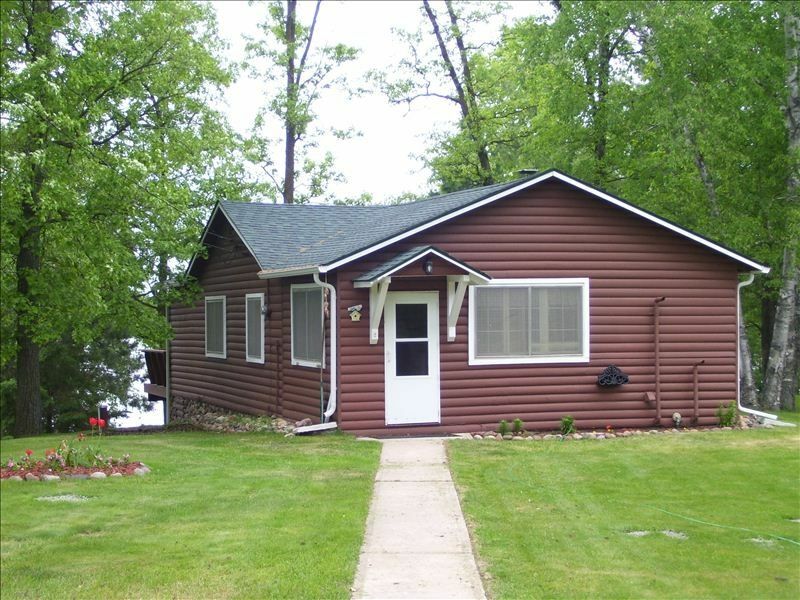 Cozy Cabin Vacation Rental on South Long Lake, Brainerd, Mn. Lake front cabin rental with a private dock and a row boat. It is completely furnished including linens and towels. The kitchen is fully equipped and for your added comfort there is a washer, dryer, telephone and cable on two TVs, Wi-FI and central heat and air. It will comfortably sleep up to 7 people. The deck stretches the entire length of the cabin with plenty of outdoor seating and a picnic table. This is the perfect spot for that first cup of coffee in the morning or a place to relax and enjoy an evening sunset while listening to the sound of the Minnesota loons. Grandfather Clarence Anderson bought this cabin in the early 1950s. It has since been renovated and passed down three generations. Love sitting on the deck listening to the loons and watching the sun set. Watching the bald eagle fly overhead but most of all the fishing! Faces west so you'll get some breathtaking evening sunsets while listening to the sound of the Minnesota loons. Lakefront property on the lower end of South Long Lake. Private telephone inside the cabin for local calling only. Bath towels, hand towels, wash cloths, kitchen dish towels and dish wash cloths. Murphy bed, day bed with pop-up trundle underneath, three chairs. Full refrigerator with ice maker. Coffee fliters. Sugar. Flour. Spices, etc. plates, glasses, coffee cups and flatware. Table with four chairs and four folding TV trays. 32' in living room and 27' in bedroom. on shelf between living room and dining room. in lower cabinet under hutch in dining room. DVD player with some movies. 14' row boat and life vests. This cabin was wonderful! It was comfortable, nicely equipped, furnished and was in a pretty setting. It's a bit away from where we wanted to be and the weather wasn't great while we were there, but we still enjoyed our time in the Brainerd area. We found the cabin to be very clean and well cared for. I treated my three sons to a few days of fishing. The first day it rained, so no fish. Our luck changed on Saturday! I reported a couple of issues that need attention and the owner appreciated being made aware of them. Thank you for an enjoyable weekend! Very clean, cozy, and comfortable! We were very happy with our stay at the Anderson cabin! It was beyond our expectations, actually! First of all, Sandy was readily available to answer any questions, and even asked “if we needed anything” before she came out to drop something else off quick. The cabin was very clean, and more spacious than what the photos online depict, in my opinion. There is only one bedroom, but if it works for your family like it did ours, a curtain was available to partition off the futon with the Murphy bed area. We were able to let our dogs run free by the lake, swim, and chase the ball in the yard without concern about upsetting the neighbors—they also had dogs, but on the weekdays, we were the only ones around! It was quite peaceful! The view was gorgeous. The only downfall was that it wasn’t a great area for swimming. It was weedy off the dock, as well as on the shoreline. Although, Sandy said there is a sandy area by the boat launch which is just quarter mile away. This is a true lake cabin that has been updated beautifully. The owner was gracious and helpful. The cabin was very clean and we plan on returning. The owner is very accommodating. The cabin was clean, well stocked and comfortable. Fishing was good too! A great relaxing week in a nice comfortable modern but rustic cabin. $200 damage deposit is required to book a reservation and is not included as rent.